should i study master? why study master? this questions is what will give us reasons master degree is important. Increase your access to better jobs, an undergraduate qualification alone may fail to get you noticed by prospect employers. Proofs shows and suggest that having a master degree gives a better edge over bachelor degree in employment and earnings in life. It a good achievement completing postgraduate, this proofs your ability to tackle, solve complex and challenging tasks. Master degree also help to enhance and channel you to specialization in a specific profession. take example marketing or engineering, master is not only for employment but help to build career path and skills. Never assume master degree will automatically qualify you for a job or bring employers to your door, you need to sell yourself to employers unless your master qualification relate to a specific career. Networking yourself and connecting to people, discuss, build your knowledge and skills. While at undergraduate level it more of self study, cramming. But master is about connecting to people professionally. and not just fellow students only. Degree in master boost your networking and connection for a better career, reason be that you connect with professionals who are like minded with professional skills. Some see returning to university as an odd decision, postgraduate study can be an excellent way for professional development if you already working. A high skilled profession that is fast moving will require you to develop yourself and keep you abreast with technologies, development that will enhance you. Lots of training exist in postgraduate study for professional development. Master degree are required as support and preparation for PhD. Before a study in PhD, a master degree need to be obtained and mostly required for a PhD. Not all student begin master immediately after undergraduate degree, many return later for master and then PhD. A taught master degree is a good link between Undergraduate and PhD Level. A graduate degree will give an opportunity to contribute to your field, add a break through to information research, advance your knowledge and understanding within your field. Want to move into an academic role. Many who graduate from university and take professional career come are good at lecturing as their field experience as professionals are good in lecturing. 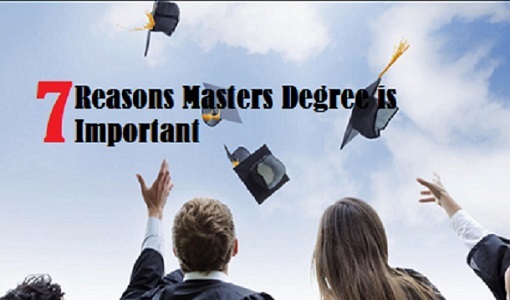 If you decide that an academic career is best for you then a master degree will be a good decision. A seriousness in your profession can be observed from the time taken for further study in your profession or field. A great way of preparing yourself for a more senior role is taking a master study. This does not majorly mean taking a programe or course dedicated for management. A practical expertise can be enhanced by taking a master degree.